Tuesday 21st February saw my debut playing poker on the television when I participated in the much anticipated and much talked about William Hill Poker Grand Prix. This was billed as being the best ever 'made for TV' poker tournament in terms of the players involved, the structure of the competition and the level of play allowed as well as the amount of play the viewer would get to see - Did it live up to this billing?... It's been fantastic! I really don't think anyone will be disappointed. The event delivered everything it promised, including over £100,000 added money and has clearly set a new benchmark for sponsored TV poker. The heats were actually filmed back in October 2005 but with contract delays, a desire to get the production right rather than rushed and a fight for who was going to air this much anticipated event means it has taken until now for the show to find its way onto our screens courtesy of Sky Sports. My entry into the tournament was a last minute decision. I hadn't previously been asked to play, and wasn't in the original draw, and quite rightly so - this was a tournament designed to be total box office and just the big names and form players were invited. However just days before the start a number of players dropped out for various reasons and the William Hill team were all pulling together to try and fill the vacant slots. I ran into William Hill sponsored player; Julian Thew at our local casino in Nottingham and just happened to ask him if he was ready for his heat and was he looking forward to the competition. He mentioned the late drop outs and the troubles they were having in filling the slots so I offered my services and it looks like they really were desperate as they let me (a cocky young newbie from Notts. play). &amp;#61514; I couldn't wait! It seems like forever since I was taking that long journey down to the TV studios in Cardiff but I can remember the excitement I felt about being part of this event and couldn't wait to get involved. Five hours, four trains, six phone calls for directions and one eventful taxi ride later I was finally at the studios where I met my pal Thewy. He was watching his William Hill stable mate Steve Vladar play his heat so I decided to go to the studios and watch too and sample the atmosphere rather than going straight to my hotel. The set up was amazing, a relaxing 'green' room with sofas, tables and chairs and a huge plasma screen on the wall where we could see and hear the action (minus hole cards of course). The hospitality was great too, with as much food and drink as you could manage and everyone was in great spirits - even Jesse May was on a high despite being the world's worst bookie, losing for the fifth consecutive day. Following the conclusion of Steve's heat (which can be seen this Tuesday, the 28th of February on Sky Sports) we all retired to the hotel for a few drinks and for those poker junkies amongst us (of which there were many) a 14-handed sit and go ensued. I finally hit the hay around 2a.m. and dreamt of nothing but victory the following day. We arrived at the studios by people carrier the next day at around 1p.m. and I was immediately greeted by the producers of the show, the William Hill Poker Manager and a lovely young lady who I was informed would be doing my make-up! Wtf? "Make-up?" I said "That stuff that girls wear to make themselves look pretty"? - My protests were laughed off, resistance was futile and before I could say "max-factor" the make-up lady was slapping some foundation on my face, playing with my hair and "defining my eyes" - whatever that means! Anyway, after make-up I was miked up and it was game on! I had already met three of my opponents (Brian Wilson, Barney Boatman and Marc Goodwin) the previous evening in the bar so I was totally relaxed before we started and couldn't wait to get going. I had a tough seat with Christer Johansson (WPT winner and all-round aggressive Scandie) to my right and Brian Wilson (WSOP PLH champion and general loose aggressor) to my left and this being the finest field ever assembled in Europe for a TV event, it was not going to be easy. I started patiently, playing only premium hands and picking my spots to be aggressive and before I could get settled in we had gone from 8 players to 7 players when Patrick Antonius' (EPT winner and on-line millionaire) KK was no match for Brian Wilson's 4-5 on a 553 flop. Brian was pretty much running the show raising, re-raising, talking and jabbering his way into table captaincy. The play slowed somewhat and the first hand I get involved in sees me holding 10-10 on a 10-6-7 board against Marc Goodwin who held 66 and I still to this minute do not now how he did not give me all of his chips - it was an excellent wriggle out by an excellent player but what I did win from him put me into second chip position and settled me down nicely. In general the action was slow (unless Brian was involved) and he eventually went from chip leader to cheer leader before dinner break pushing his luck one too many times with Barney being the main beneficiary of his loose aggressive play and we were down to 4 players at feeding time. I was now second favourite with 'Jesse May bookmakers' and could feel myself growing more and more confident of winning the heat. Just after dinner I won a big pot from Robert Cooper when his minimum raise with Q-9 on the button into my BB meant I couldn't pass my 4-7 as it was a mandatory call with my 2-1 odds. A board of Q-7-8 and another small bet from Robert meant I called again for value and when the turn brought a 4 I bet and he moved all-in instantly. I called and he didn't improve so that left us 3-handed with Barney having the chip lead, myself in second and Christer in third. The battle at three handed lasted about and hour and twenty minutes, with Barney largely staying out of trouble and only playing with solid hands and with Christer absolutely dominating me. I felt like I had finally come as far as I could in the heat and the game had gone to another level. The final scheduled break came just in time as I was really feeling the pressure of Christer's aggression. I decided to take a walk outside and get a breath of fresh air. I went back in with renewed confidence and vigour and began playing back at Christer at every opportunity. Barney had over half of the chips in play and was really waiting for the heads up stages, so it was me and the Scandie that had to go to war. I re-raised Christer three times in the space of 8 hands, which got our chips virtually level with me slightly covering him when the following hand came up. I held A-10 and it was me to act first with Christer in the BB and Barney in the SB. 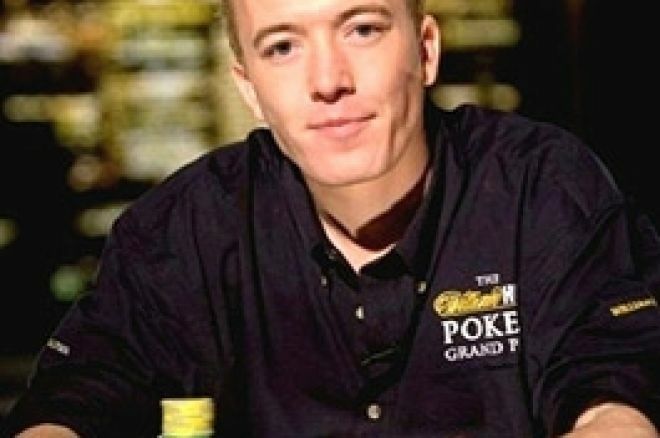 I knew that Christer was looking for any opportunity to push all-in on me and I decided that he was going to do it this hand and that I had to raise and commit to calling the all-in. I made a larger than standard raise and as predicted he moved all-in. My commitment to call suddenly waned and I had all sorts of demons telling me I was beaten and that I could wait for a better spot but I eventually drummed up the courage to call and he flipped over his Q-9. A Queen on the flop started the early stages of a heart attack for me and I cursed quietly to myself but an Ace on the turn put me back in front and that's where I stayed after the river. Christer was out and we were now heads-up. I now had slightly more chips than Barney and I could see he was slightly un-easy but knew he was a class player that I would have difficulty in beating heads up but to be honest I could only see me winning and nothing else. I really got the benefit of the cards heads-up but played good aggressive poker too picking up a lot of pots uncontested and I had Barney beaten after about 25 minutes. Once we got heads-up I knew I was going to win. Nothing was going to get in my way of victory, I had the momentum and there was no pressure on me as I wasn't expected to get this far let alone win the heat. When it was over I entered the green room to huge applause, big smiles and some friendly faces. I did the TV interviews in a state of euphoria and settle down on the sofa with a beer next to my old man who had travelled down that morning to support me. This really was my finest hour, my greatest achievement in the game so far, but I wanted to go one better, there was a final to play in a few days and I wasn't going to be playing for second! The final of the William Hill Poker Grand Prix can be seen on Sky Sports on Tuesday 14th March. Ed note: Now visit Bet Direct Poker for the softest cash games around.